Webvolution Designs Atlanta Web Design Company launches new website for Los Angeles, Calif. based realtor Josh Shadid (DRE# 01875542) of the Coldwell Banker Hancock Park South office on January 3, 2011. The Webvolution Designs Atlanta Web Design Company announces the launch of a brand new website for Los Angeles Realtor Joshua D. Shadid (DRE# 01875542), a real estate agent specializing in residential real estate brokerage, Foreclosures & Short-Sales. 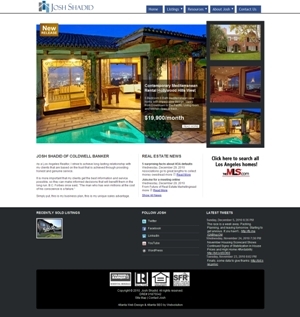 The new Los Angeles Real Estate website, developed by Webvolution Designs Atlanta Web Design company on the search engine friendly Exponent Content Management System platform, features Josh Shadid's Los Angeles Property Listings for homes for sale, homes for rent, Foreclosures/REOs and Short Sales. The new website also features a property wish list questionnaire for site visitors to fill out and print off as helpful organizer prior to meeting with the Realtor. The new real estate website is also rich with helpful real estate information as it features a Los Angeles real estate blog, California real estate market data, a mortgage calculator and full MLS property listings search and a detailed overview of 20 Los Angeles County neighborhoods. For more information on Josh Shadid of Coldwell Banker you can mail the Hancock Park South office at 119 N. Larchmont Blvd. Los Angeles, CA 90004. You may also visit http://joshshadid.com or call (323) 860-4234. I have to say i am very impressed with the way you efficiently website and your posts are so informative.